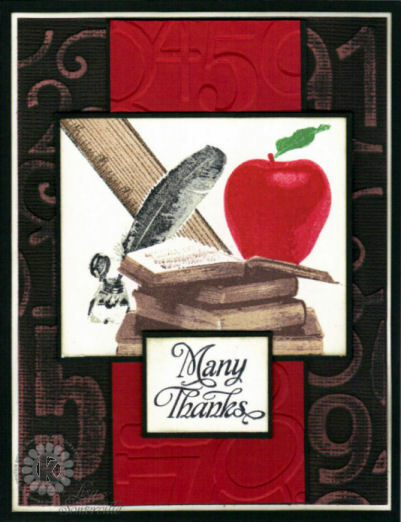 As the end of the year quickly approaches, I wanted to share a School Themed Thank You card, perfect for an end of the year Thank You for a teacher. All images are from Kitchen Sink Stamps 3 Step School Days. The background panel was created using the Sanded Core'dinations Technique using Black Magic Core'dinations card stock and the Numbers Folder from Cuttlebug. I stamped the images from Kitchen Sink Stamps, starting with the Book, then covered the images with Eclipse Tape to add the other elements into my grouping. Don't forget to check out this weeks Wednesday Blue Plate Specials at Kitchen Sink Stamps! You never know what you might find on sale in the Kitchen! Click here to save 10% on all your Kitchen Sink Stamps purchases - this offer can be combined with the Blue Plate Specials! Lisa this is wonderful - love that you sanded down the embossing - makes such a statement. Great card. This one gets the Golden Apple Award! Beautiful!!! How creative! This is a wonderful thank you.